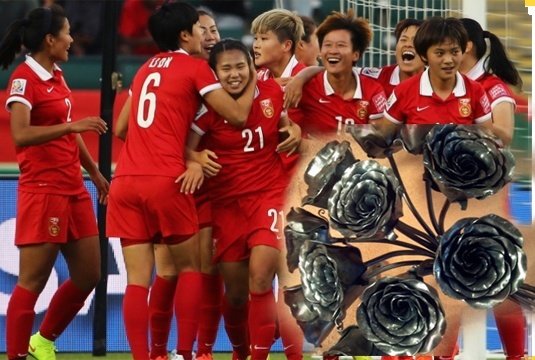 Why Is the Chinese Women's Soccer Team Called "Steel Roses?" Now that the 2015 FIFA World Cup has reached the quarterfinals, and a showdown 16 years in the making between China and the U.S.A is underway, the Chinese women’s team has been in quite a few headlines. You may have noticed that the Chinese team is sometimes referred to as, “Steel Roses.” Many other teams have their own nicknames. In fact, Canada and USA are the only two soccer teams at the World Cup that don’t have official nicknames. Colombia: “Las Cafeteras” = “The Coffee Growers”. WHERE DID THE NICKNAME "STEEL ROSES" COME FROM? The first appearance of the name was after the iconic 1999 World Cup final match, where the Chinese team lost to the U.S by a single penalty kick. After that loss, theChinese team was nicknamed “Steel Roses” or “铿锵玫瑰（kēng qiāng méi guì）” by their fans; a legacy that has been passed down to every team since. The term “铿锵 (kēng qiāng)” refers to the “clang” sound that iron and steel make, and is often translated into “sonorous.” Imagine the rich, deep sound of a brass bell or gong. That's what "铿锵" is. 玫瑰 (méi guì) is the Chinese word for “rose.” In Chinese, women are commonly likened to roses, as roses are beautiful, fragrant, and feminine. As you can see, "铿锵" has the radical “钅” for “metal” in the characters, which makes in a traditionally masculine word, implying strength and endurance. By calling the Chinese women’s team 铿锵玫瑰, they are suggesting that both traditionally masculine and feminine traits come together to form perfect harmony in the soccer team members. The “钅” symbol for “metal” is used in many Chinese characters and phrases to imply power, perseverance, and tenacity. For example, we might use the phrase “锲而不舍 (qiè ér bù shě)” to describe the Chinese women’s team as they take on the U.S team. “锲而不舍” is an idiom that means “to persevere and never give an inch.” It came from the spirit of chiseling away at something to achieve a desired result, without ever abandoning it. This is a perfect example of the beauty of the Chinese language. As one of the only modern languages that is based on pictographs and symbols, Chinese is unique in the aspect that subtle meanings are built into the architecture of the Chinese characters. We wish the Steel Roses good luck, and encourage them to live up to the legacy of their nickname! At the same time, all Chinese learners should adopt the “铿锵玫瑰” spirit and apply it to their Chinese-learning endeavors. Founded in 2004, TutorGroup, the parent company of TutorMing, created the first commercially available synchronous learning portal in the world. TutorGroup offers world class Chinese tutorsat TutorMing. For English learning, it offers VIPABC, TutorABC, and TutorABCJr. The company is backed by Alibaba, Softbank, Temasek, and Qiming Ventures.